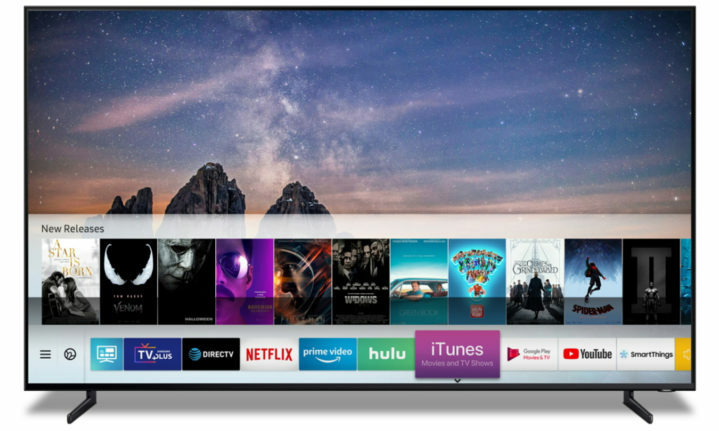 Samsung Electronics announced at CES 2019 that it will offer iTunes Movies and TV Shows and Apple AirPlay 2 support on 2019 Samsung Smart TV models later this year. Support on 2018 Samsung Smart TVs will be made available via firmware update. In an industry first, a new iTunes Movies and TV Shows app will debut only on Samsung Smart TVs in more than 100 countries. AirPlay 2 support will be available on Samsung Smart TVs in 190 countries worldwide. With the new iTunes Movies and TV Shows app on Samsung Smart TVs, you’ll be able to access your existing iTunes library and browse the iTunes Store to buy or rent from a selection of hundreds of thousands of movies and TV episodes — including the largest selection of 4K HDR movies. iTunes Movies and TV Shows will work seamlessly with Samsung’s Smart TV Services, such as Universal Guide, the New Bixby and Search, to create a consistent experience across Samsung’s platform. With AirPlay 2 support, you’ll be able to effortlessly play videos, photos, music, podcasts and more from Apple devices directly to Samsung Smart TVs, including QLED 4K and 8K TVs, The Frame and Serif lifestyle TVs, as well as other Samsung UHD and HD models. “We look forward to bringing the iTunes and AirPlay 2 experience to even more customers around the world through Samsung Smart TVs, so iPhone, iPad and Mac users have yet another way to enjoy all their favourite content on the biggest screen in their home,” said Eddy Cue, senior vice president of Internet Software and Services at Apple.